Cleaning your oven tends to be one of the most avoided jobs in the kitchen. We put it off for as long as possible, dreading scrubbing off grease and accumulated residue, and removing burnt bits of food. But it doesn’t have to be this way. Cleaning the oven may be a big task, but there are ways to make it easier and more bearable. And the reward is a sparkling clean oven that feels worth the time and trouble. That’s why we have developed the ultimate guide to cleaning your oven, broken down by area including the racks, trays and oven glass. Why should you clean your oven? If you don’t clean the oven for a while, grease and stray bits of food can get left inside. This can cause extensive smoke output the next time you cook as the food will continue to burn, resulting in a fire hazard. The smoke can trigger fire alarms and the bitter, burnt flavour may impact the taste of your meal. As with any tough job, the right tools make it easier. And the quality of your oven clean will be dependent on the type of oven cleaner you use. There is a selection of cleaning products on the market, ranging from strong solutions that make for easier cleaning and target heavier stains, versus ones with a low chemical concentration that result in a lighter clean and more scrubbing. Most people are unaware of the toxic chemical in many oven cleaning products – sodium hydroxide. Whilst the chemical is highly effective as a cleaner, it can also be highly corrosive. There are domestic cleaning products in the market that do not include these harsh chemicals, but they tend to be less effective. For more information and our recommendations for different cleaning requirements, read our guide on the UK’s best oven cleaners. Note that natural oven cleaners may require repeat applications to shift stubborn stains and grease. Here is our ultimate guide to cleaning your oven. It runs through each individual step in detail for a thorough deep clean. It’s important to cleanse all components. Checklist: What do you need? To begin ensure the oven is switched off at the mains – this is important as you will be using liquid cleaners in an electrical appliance. The oven should be cold before you start cleaning. Put rubber gloves on and ensure arms and wrists are covered at all times. Open windows – this helps ventilate any chemicals. Remove any loose bits of dirt and burnt food. Begin by removing the oven racks and knocking off any stuck-on food or debris. Place them in the large sealable bags with solution and leave for 4-6 hours or overnight. This will remove most of the tough residue. Remove the racks from the bags and scrub the remainder of the residue off with a scourer and hot, soapy water. Then rinse and dry immediately. Return to the oven once you’re finished cleaning everything. Note: If you don’t want to use the plastic bags that come with oven rack cleaning products, sealing your racks in a rubbish bag is an alternative. Or try soaking the racks in the sink in warm water mixed with washing up liquid. Leave them in there for a few hours, preferably overnight. Then continue with the steps as above. For more information and tips read our guide on How to clean your oven racks. Clear out any debris and loose bits of food. 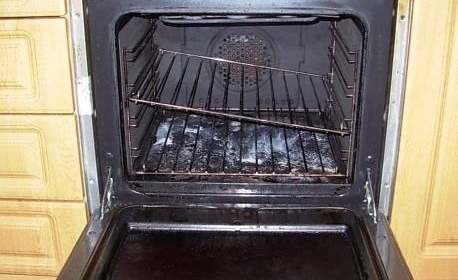 Carefully read all pack and safety instructions for your chosen oven cleaner before use. Apply the oven cleaner as directed and leave on for the time stated. Use a sponge and begin scrubbing away the grime and grease to remove it. Wipe out the oven with a wet cloth, being careful not to get anything electrical wet. Repeat application if needed for stubborn stains. Leave the oven door open at the end to allow it to ventilate. Open the oven door and lay it flat to stop the product running off. Remove any loose debris. Apply the cleaner to the glass and leave on for the required duration. Scrub gently at the glass with a sponge to remove grime and stains. You can use an old toothbrush to get into corners and crevices if needed. Wipe clean with a cloth and dry. If you still have stains or food between the oven windows, read our guide to cleaning between your oven door glass. Using a paper towel, begin wiping away any excess grease, especially parts that are accumulated in the corners of the tray – this will make the cleaning process easier. Place the trays in the sink and run warm water until the trays are sufficiently covered. Add biological washing powder and mix, this helps break down any stubborn oil stains. Leave them to soak for three or more hours – turn halfway if your trays don’t fit completely in the sink. Use a scouring pad to remove any remaining residue. Place in the dishwater for an additional final cleanse. 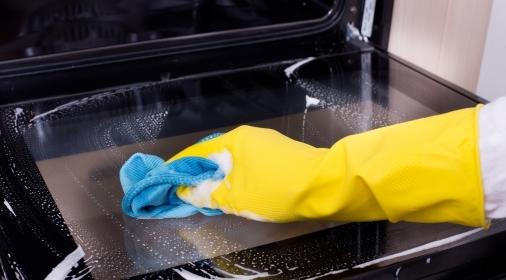 For more information read our guide on how to clean oven trays. 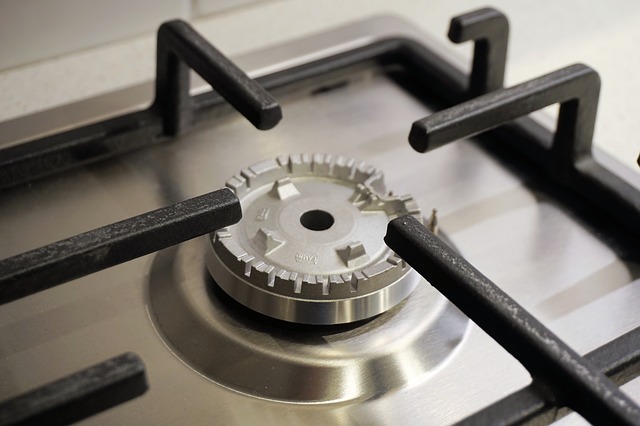 To clean the hob, remove any food debris and burners. Apply a small amount of hob cleaner to the hob – remember to read the package instructions before use. Using a sponge, lightly scrub in a circular motion. Clean the burners with warm soapy water and dry thoroughly. Wipe around any remaining elements such as the pilot light and edges of the hob with a damp cloth. For more information, read our guide on using Hob Brite hob cleaner. Allow all the components of your oven to dry and ensure there is no remaining trace of cleaning product. Reassemble the appliance, making sure each component is replaced properly. Leave oven door open if needed to ventilate any remaining product. Ovens are an important household appliance and often described as the heart of the kitchen. Many of us use them daily, especially during the winter months when we want warm, nourishing dinners. But this regular use means they can quickly pick up wear and tear, and they are very expensive to replace. When you clean your oven, you will be more likely to spot damage earlier on, helping to extend the life of your oven. If these issues do arise, it’s best to get a professional in to assess the damage and fix it. Some cleaning solutions will claim to provide a deep clean, but they are often limited to just targeting grease and light surface grime. They won’t be able to remove any carbon deposits or built up dirt in filters and mechanisms. If there is dirt left in the mechanisms, over time it can affect the functioning of the oven and make it less efficient, decreasing its life span. A professional oven cleaner will be able to get deeper to remove grease deposits in the mechanisms. 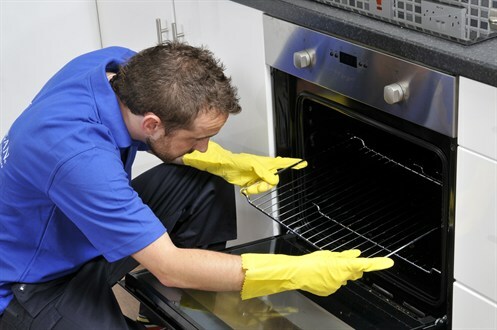 Professional oven cleaners have the ability to dismantle your oven and reassemble it. They understand how it works and which bits to take apart to get the best clean. 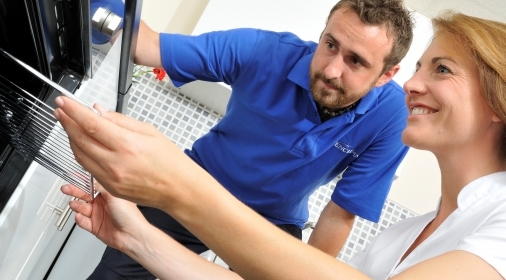 They can also carry out a maintenance examination to find any damage that has occurred. In comparison, home cleans are not as thorough. Therefore, having a full service means you have the comfort of knowing your appliance is working to its optimum efficiency. Home cleans can often expose you to harmful chemicals and become a very messy task that results in a big cleanup. At Ovenclean, we use safe, non-toxic and non-caustic products to maintain a hygienic and chemical-free environment. 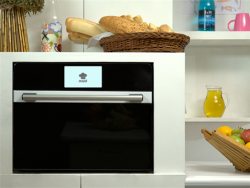 Our products allow you to use the oven as soon as we leave. In addition, when we soaking oven components, we place them in a bath outside your house so your home can stay spotless. Here at Ovenclean, we have a network of specialist oven cleaners who work with all types of oven brands and models, including range and Aga cookers. We also offer a selection of additional cleaning services while we are there, including the hob, extractor hood and microwave. Our professional oven cleaners are fully equipped to clean your oven and get it sparkling. Call us on 0800 840 7127, or complete our online form for your free quote.